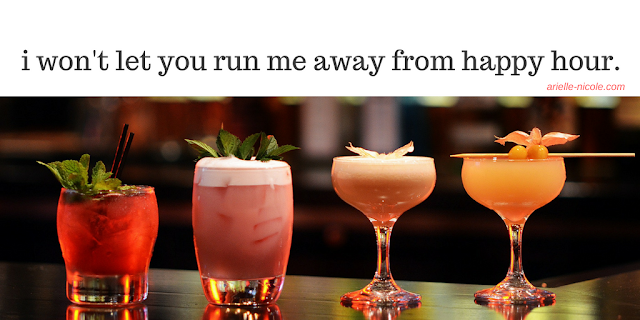 I Won't Let You Run Me Away From Happy Hour. Full disclosure, y'all will not be receiving the full disclosure. Now, on with the story. I had a close friend throughout undergrad. We had a misunderstanding, as friends sometimes do, but one pointless conversation here, and some hurt feelings there led to a gradual decline in contact; and now, we aren't involved in each other's lives at all. In the beginning of the end, the more I tried to ignore them, the more I noticed their comings and goings. It's hard to avoid someone when the social scene is so small, as was the case at my university. It got increasingly hard to go out, because they were guaranteed to be wherever the party was at. I didn't want to be seen by them, and I didn't want to be brought up by mutual friends. Leave me alone. Don't look in my direction. Why won't you accept that I don't want to be around you? I know the easy solution would be to either express how I was feeling or just stay inside, but this is my story and that's not how it went, okay? Anyways. I'm a mind over matter type of chick, so after dealing with my mounting anxieties (so many panic attacks and mid-day breakdowns, my goodness -- I was really in mourning about this! ), I'd stop. Breathe. Walk over to my closet, pick my outfit, and go on with my day. When it's your senior year of college, there's simply too much life to live outside of the bed, and I wasn't going to let one person run me away from it all. Meanwhile, I don't know (or *particularly* care) what they're thinking or feeling, but I do know they're not going down without a fight. You know when someone wants you to notice they're in your space, in the hopes that you'll react? Our relationship was reduced to that. There's me, doing my best to enjoy myself without contact, and them, going out of their way to let me know: "Hey, I'm here! Haven't seen you in a long time." Well hon, that's what people do when they don't want to be seen. That's the problem with falling back from someone who really knows you, they can sense as soon as you start to slip. I hate that I care at all, and that there's probably still room for a friendship here, because I've worked for months to shut them out. After all, we didn't get here out of nowhere. I won't forget what happened and I can't forget how it made me feel. ...because I've graduated. I am enjoying the relative peace of not hearing their name every day, or having awkward run-ins at Walmart at 3 am, but I know I'll have to face them one day. For now, I'll continue to keep to myself, and keep their Twitter muted. There are a few things y'all could take away from this. Maybe it's a reminder that communication is key. Perhaps I've reinforced your decision to keep someone an arm's length away. But what I really hope you accept is that life cannot stop just because a certain someone is around. Miss a function because they're gonna be there? Oh nah, well drinks are $3 from 4-8, you better go have a good time! Shoot, you know they will.